The anatomy of the respiratory system can be divided into 2 major parts, airway anatomy and lung anatomy. Lung anatomy includes the lung parenchyma, which carries part of the conduction system but is mainly involved in the gas exchange at the alveolar level. The lung parenchyma is further subdivided into lobes and segments. The purpose of this chapter is to provide a better understanding of the anatomy of the airways and lungs, which will help the health provider to recognize and manage different respiratory abnormalities. Dynamic CT scan of chest during inspiration in normal patient. Dynamic CT scan of chest during expiration in normal patient. See how anteroposterior diameter of the trachea decreases because of collapse of posterior wall. The tracheal wall has 4 different layers: mucosa, submucosa, cartilage or muscle, and adventitia. The posterior tracheal wall lacks cartilage and instead is supported by a thin band of smooth muscle. The airways divide by dichotomous branching, with approximately 23 generations of branches from the trachea to the alveoli (see the images below). CT scan of chest (coronal view). Trachea, main carina, and right mainstem bronchus with upper, middle, and lower lobe airways can be seen. Left mainstem bronchus is also seen with upper lobe airway. Left lower lobe airway cannot be seen. Bronchi are composed of cartilaginous and fibromuscular elements; however, the distinction between these elements is less clear-cut in the bronchi than in the trachea, especially on the more distal airways. The wall thickness is approximately proportional to the airway diameter on airways distal to the segmental branches. For airways less than 5 mm in diameter, the wall should measure one sixth to one tenth of the diameter. Different systems of nomenclature have been applied to the bronchial tree over the years. In general usage, there are 2 mainstem bronchi (right and left) and 3 lobar bronchi (right), with a total of 10 segmental bronchi; 2 lobar bronchi are found on the left, with a total of 8 segmental bronchi. No accepted terminology for subsegmental bronchi exists. The terminal bronchioles, including respiratory bronchioles, alveolar ducts, and alveolar sacs, are discussed elsewhere (see Microscopic Anatomy section). Generally, the length and diameter of the central airways vary from right to left. The vascular supply of the trachea and bronchial tree depends on branches from the inferior thyroid arteries, intercostal arteries, and bronchial arteries (aortic branches). These arteries (except the thyroid artery) form a peribronchial plexus that follows the bronchial tree deep into the lung parenchyma to supply blood also to the visceral pleura and the walls of the pulmonary arteries and veins (vasa vasorum). Some symmetry exists between the right and the left lungs. Both lungs are divided into lobes (see the image below). The gross functional subunits of each lung are called segments and have a close relation with the segmental bronchi described above. The right lung comprises 10 segments: 3 in the right upper lobe (apical, anterior and medial), 2 in the right middle lobe (medial and lateral), and 5 in the right lower lobe (superior, medial, anterior, lateral, and posterior). The left lung comprises 8 segments: 4 in the left upper lobe (apicoposterior, anterior, superior lingula, and inferior lingula) and 4 in the left lower lobe (superior, anteromedial, lateral, and posterior). 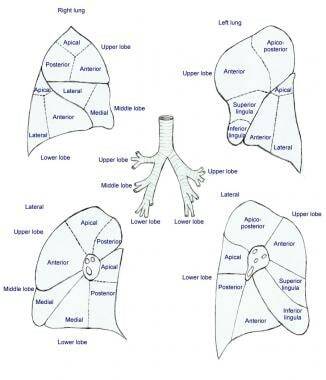 Lung anatomy: lobes and segments. Each lung is covered by the visceral pleura, which covers the surface of the lung and dips into lobar fissures. Near the hilum and mediastinum, it reflects and becomes parietal pleura, which covers the inner surface of the respective hemithorax, and thus creates a potential space (pleural space). The visceral pleura forms invaginations into both lungs, which are called fissures. There are 2 complete fissures in the right lung and 1 complete fissure with an incomplete fissure in the left (see the image below); these separate the different lung lobes. The pleura also forms the pulmonary ligament, which is a double layer of pleura that extends caudad along the mediastinum from the inferior pulmonary vein to the diaphragm. CT scan of chest (coronal view). 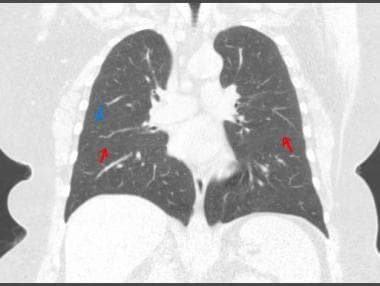 Blue arrow points at minor fissure in right lung. Red arrows show both major fissures. 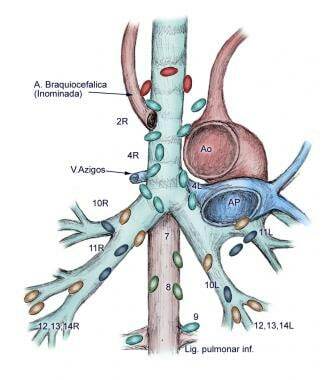 A close relation exists between the bronchial tree and the anatomy of the pulmonary vasculature, composed mainly of the pulmonary arteries and veins (see the image below). The main pulmonary artery originates in the right ventricle and divides into 2 branches. The right pulmonary artery passes posterior to the aorta and the superior vena cava, emerging lateral to the atria and anterior and slightly inferior to the right mainstem bronchus. In contrast, the origin of the left pulmonary artery is situated anterior to the left mainstem bronchus. The arborization of the pulmonary arteries varies from right to left but mainly divides into truncal, lobar, segmental, and subsegmental arteries, which generally follow the branches of the bronchial tree. Pulmonary artery and vein in relation to airways and lungs. The pulmonary veins originate in the alveoli and also receive drainage from the bronchial and pleural branches. 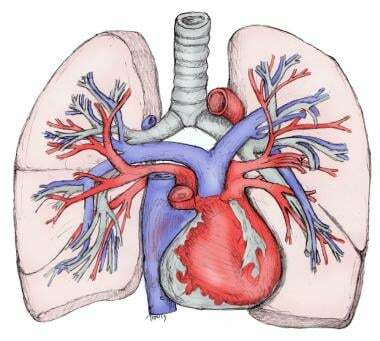 After the confluence of the small branches into bigger ones, 2 pulmonary veins, superior and inferior, are formed on each side. These 4 veins typically join at or near their junction with the left atrium, and usually this common area is intrapericardial. The lymphatic drainage of the lungs start with lymphatic vessels that first drain into intraparenchymal lymphatics and lymph nodes, then move to peribronchial (hilar) lymph nodes, and subsequently move to subcarinal, tracheobronchial, and paratracheal lymph nodes (see the images below). The lymphatics eventually communicate with the venous system via the bronchomediastinal lymphatic trunk and the thoracic duct or via the inferior deep cervical (scalene) lymph nodes. However, some variants of the lymphatic drainage are very important to consider overall in the dissemination of pulmonary neoplasms (see Pathophysiologic Variants). Mediastinal and hilar lymph nodes. Terms reflect nomenclature used for staging of lung cancer. CT scan of chest (coronal view) showing different mediastinal and hilar lymph nodes. (Red arrow: station 4 left; green arrow: station 7; yellow arrow: station 11 right.) Terms based on lung cancer nomenclature. The trachea has multiple layers (see the image below). The mucosa is composed of a ciliated pseudostratified columnar epithelium and numerous mucus-secreting goblet cells that rest on a basement membrane with a thin lamina propria (mainly collagenous). The submucosa contains seromucous glands. The adventitia contains cartilaginous rings interconnected by connective tissue. The hyaline cartilage rings have the form of the letter C and are opened posteriorly. The open ends are connected by fibroelastic tissue and a band of smooth muscle (the trachealis). Microscopic picture of trachea showing different layers: mucosa, submucosa, cartilage. 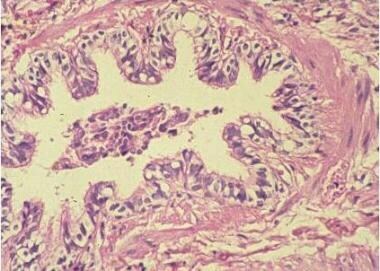 The epithelium of the bronchus is pseudostratified columnar ciliated epithelium, also with numerous goblet cells. 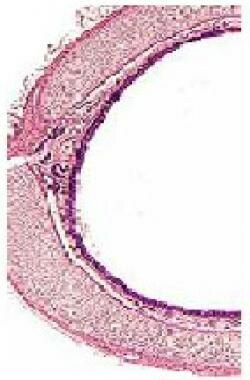 This epithelium transitions first into a simple columnar ciliated epithelium and then into a cuboidal epithelium as it continues branching into smaller bronchioles. The cartilage support is eventually lost at the bronchiolar level (0.5-1.0 mm diameter). The muscle layer becomes the dominant structure and is composed of smooth muscle and elastic fibers (see the image below). At this level, the mucosa may be highly folded because of the loss of supporting structure. Microscopic picture of bronchus (hematoxylin and eosin stain). Note mucosal layer with multiple goblet cells. Smooth muscle layer is in periphery. Image courtesy of Dr. Chad Stone. The terminal bronchioles are considered the respiratory zone of the lungs (ie, the area where gas exchange occurs). They divide into respiratory bronchioles, which continue downstream as alveolar ducts that are completely lined with alveoli and alveolar sacs (see the image below). Over 300 million alveoli exist in the human lung, all of them covered by an extensive network of capillaries (branches from the pulmonary arteries). The respiratory zone constitutes most of the lung (2.5-3 L). Microscopic picture (hematoxylin and eosin stain) of alveolar sacs and alveoli. Image courtesy of Dr. Chad Stone. The epithelium of the respiratory bronchiole is primary cuboidal and may be ciliated; goblet cells are absent. The supporting thin layer is formed by collagenous and smooth muscle. Alveoli appear as small pockets that interrupt the main wall. The terminal portion of the respiratory duct gives rise to the alveolar sacs (composed of a variable number of alveoli). The alveoli are the smallest and most numerous subdivisions of the respiratory system. The interalveolar septum often contains 10-15 μ m openings between neighboring alveoli that help equalize air pressures among them. The alveolar wall is very thin (25 nm) and formed by squamous epithelium (type I cells) covered by a thin film of surfactant fluid rich in hydrophilic phospholipid produced by type II cells (septal cells). This surfactant fluid keeps the alveoli open by reducing the surface tension of the interface between opposing alveolar surfaces, which reflects into reduced inspiratory work. The respiratory epithelium is composed mainly of type I cells (98%), along with some type II cells. The basal lamina is in intimate contact with the capillaries from the pulmonary vascular system, favoring the transfer of oxygen to the red blood cells and the release and transfer of carbon dioxide to the alveolar airway. As a human being develops from a fetus to a fully developed adult, several changes take place. Some of these changes follow regular patterns, and others either compensate for certain conditions or occur for unknown reasons. 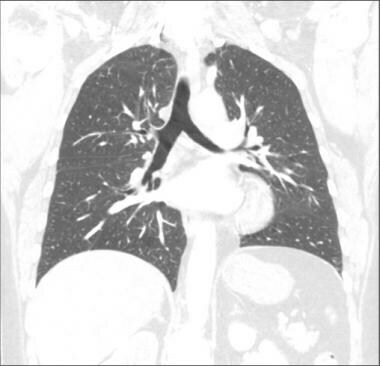 CT scan of chest in patient with congenital third fissure in right lung. Abnormal fissure is seen below major fissure in right. 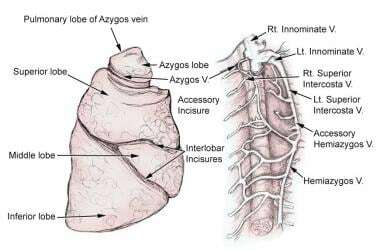 Azygous lobe. This lobe was created by azygous vein as it descended into thorax during embryonic development. 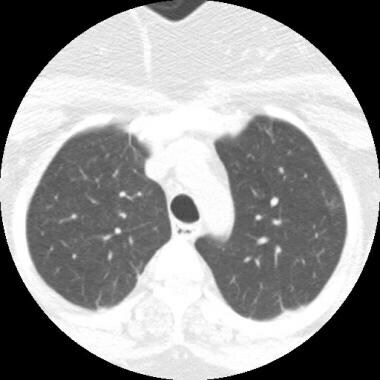 CT scan of chest in patient with acquired right middle lobe bronchiectasis due to chronic nontuberculosis mycobacterial infection. 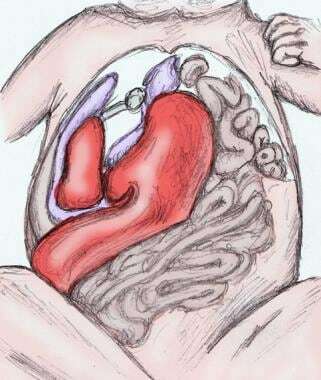 Congenital diaphragmatic hernia, with displacement of liver and intestines into chest cavity. Pathologic variants are related to changes in the structure of the airways, the lung parenchyma, or adjacent structures that lead to disruption of the normal anatomy of the respiratory system. The most common such variants are presented below. 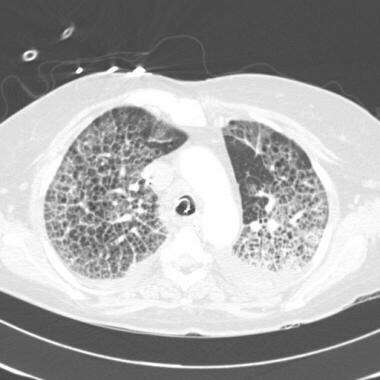 Emphysema and chronic obstructive pulmonary disease are caused by an accumulation of inflammatory mucus that gives rise to a loss of elastic recoil resulting from lung tissue destruction or to an increase in the resistance of the conducting airways, leading to an abnormal permanent enlargement of air spaces distal to the terminal bronchioles (see the images below). 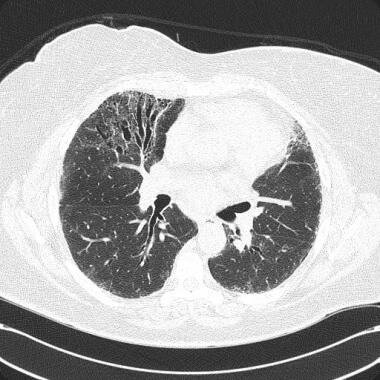 CT scan of chest in patient with emphysema from smoking. Note formation of bullae in upper lobes. 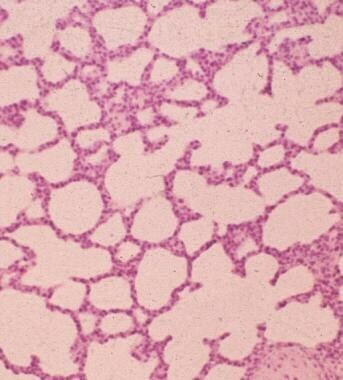 Microscopic picture of emphysematous lung (hematoxylin and eosin stain). Upper part of picture shows destruction of alveolar septa. Lower part of picture shows normal alveoli. Image courtesy of Dr. Chad Stone. Pneumothorax, hemothorax, and hydrothorax are caused by a decrease in lung volume secondary to the presence of air, blood, or fluid between the visceral and parietal components of the pleura (see the images below). 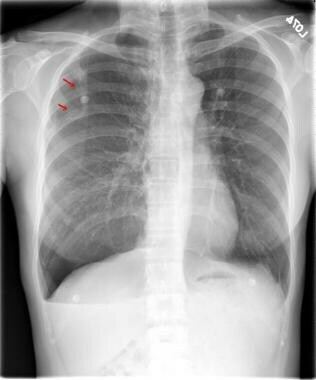 Chest radiography of patient with spontaneous right pneumothorax. Red arrows delineate lung edge. 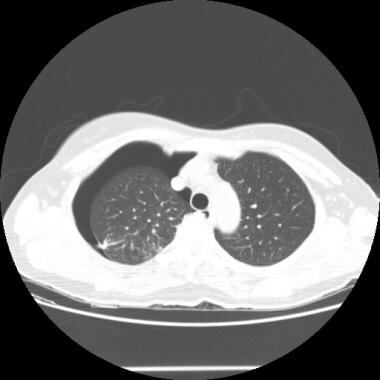 CT scan of chest in same patient with spontaneous right pneumothorax. 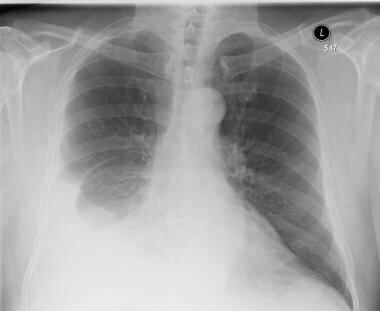 Chest radiography of patient with right pleural effusion. 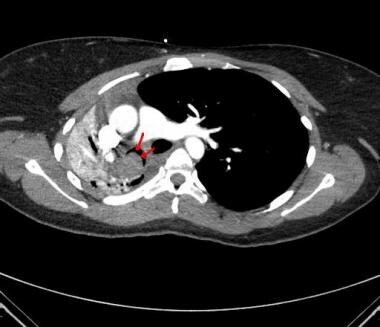 CT scan of chest in same patient with right pleural effusion. Red arrows point at effusion. Left lung is normal. 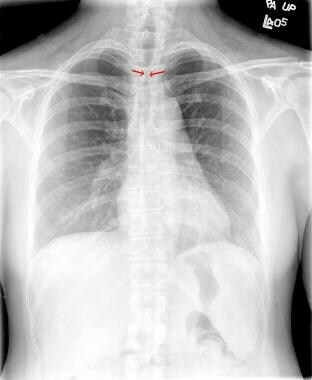 Diaphragmatic hernia occurs when a defect in the diaphragm allows the abdominal contents to move into the chest cavity (see the image below). This could be congenital, traumatic, iatrogenic, or due to a weakness over the muscles forming the diaphragm. 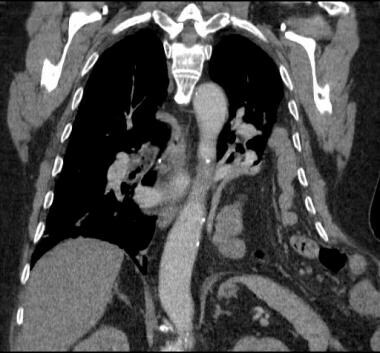 CT scan of chest of patient with large left diaphragmatic hernia. Note bowel loops and mesenterium inside left chest cavity. Bronchial and tracheal stenosis occurs as a result of secondary and numerous malignant and benign processes and is also a consequence of surgical procedures and trauma (see the images and video below). The main defect is the obstruction or collapse of the airways at any level, which leads to changes in airflow that result in hypoxemia. 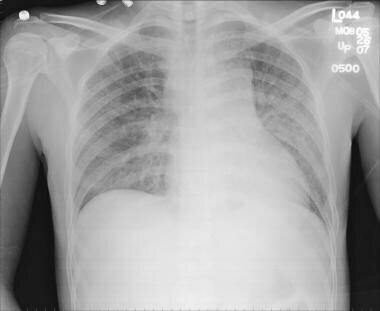 Chest radiography of female patient with tracheal stenosis due to previous endotracheal intubation. Red arrows show area of narrowing in trachea. 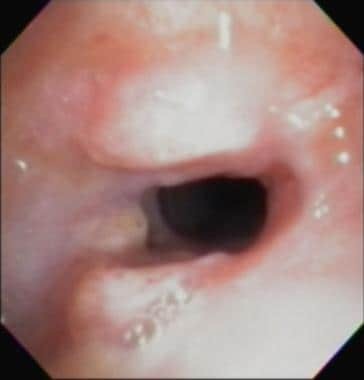 Bronchoscopic picture of trachea showing area of stenosis (cicatricial stenosis) from previous endotracheal intubation. 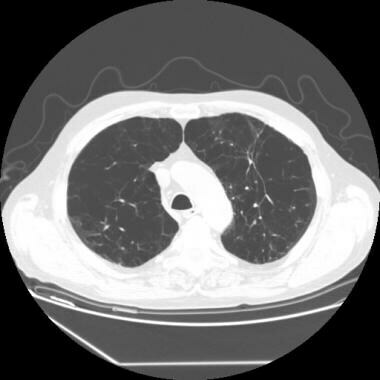 CT scan of chest in patient with tracheal stenosis due to lung cancer. 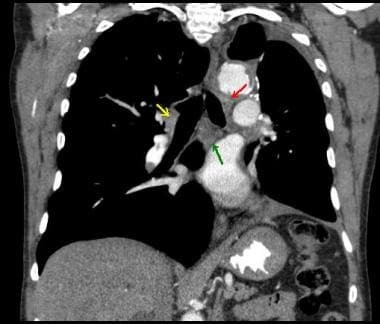 Yellow arrows show tumor invading lateral wall and growing into trachea, causing stenosis. (T=tumor). 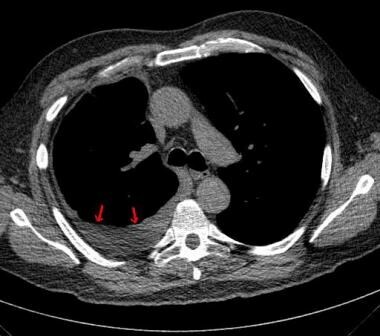 CT scan of chest of patient with endobronchial carcinoid tumor of right mainstem bronchus (red arrows) causing complete collapse of right lung. This video demonstrates the results of rigid direct laryngoscopy and flexible tracheal endoscopy in a patient with significant tracheal stenosis. In most cases, paralysis or dysfunction of the vocal cords is caused by dysfunction of the recurrent laryngeal or vagus nerve innervating the larynx. Even when no real alteration of the anatomy is present, this condition may cause many of the same problems associated with bronchial and tracheal stenosis. Infectious etiologies (eg, bacterial pneumonia and tuberculosis) include viral, fungal, and bacterial infections. They are characterized by consolidation of the affected part of the lung and filling of the alveolar air spaces with exudate, inflammatory cells, and fibrin, leading to a decrease in oxygen exchange (ventilation mismatch) and, in severe cases, to destruction of the lung parenchyma (see the images below). 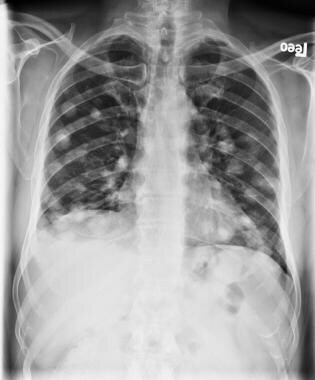 Chest radiography of patient with miliary tuberculosis. 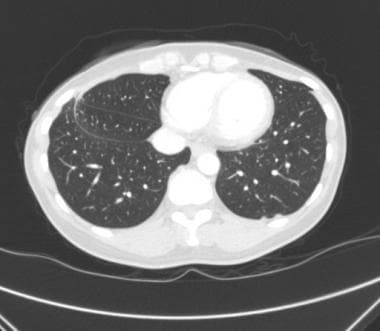 CT scan of chest of patient with chronic invasive aspergillosis. Note bilateral nodular infiltrate with cavitations. 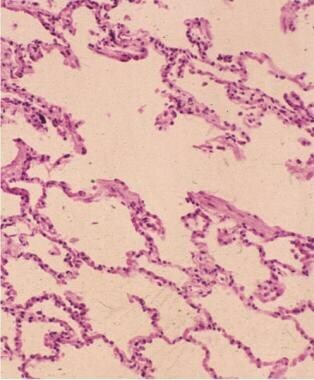 Micrographic picture of lung parenchyma showing areas of necrosis with organizing pneumonia in patient with Nocardia (hematoxylin and eosin). Image courtesy of Dr. Chad Stone. Interstitial lung diseases include conditions caused by drugs, autoimmune processes, fibrotic diseases, organic and inorganic dust exposure, sarcoidosis, lymphangioleiomyomatosis (LAM), histiocytosis X, vasculitis, pulmonary alveolar proteinosis, and any other process that will cause reduced lung volumes due to an alteration in lung parenchyma leading to ventilation-perfusion mismatch (see the images below). 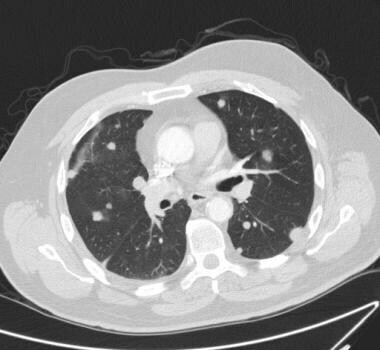 CT scan of chest in patient with pulmonary alveolar proteinosis. Note classic "crazy pavement" pattern of lungs. 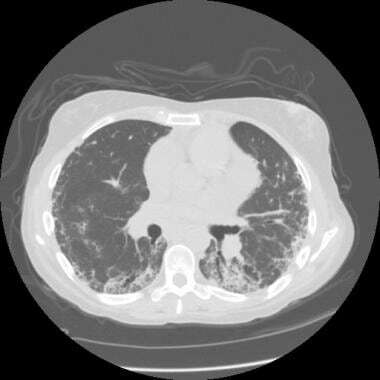 CT scan of patient with usual interstitial pneumonia. Note interstitial infiltrates and honeycombing in periphery of lungs. 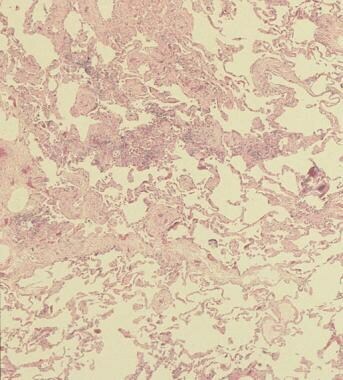 Micrographic picture (hematoxylin and eosin stain) of lung with usual interstitial pneumonia. 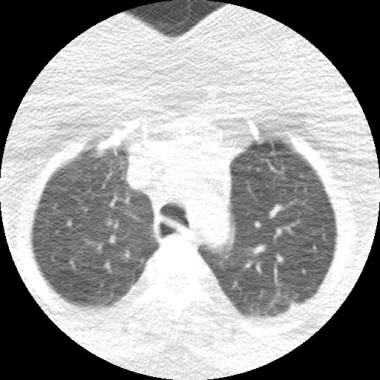 Note alternating areas of normal lung, interstitial inflammation, fibrosis, and honeycomb change (patchwork appearance). Image courtesy of Dr. Chad Stone. Malignancy is an uncontrolled cell growth of the tissue in the lungs or airways. Depending on the location and severity of the malignancy, it may lead to any of the above described anatomic changes. 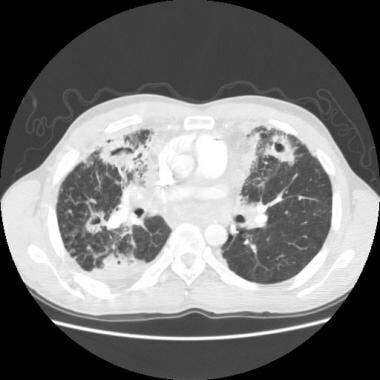 Chest radiography of patient with metastatic melanoma to lungs. 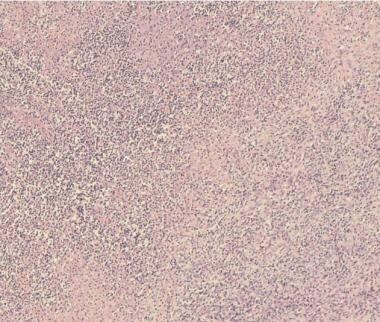 Note bilateral nodules (metastasis). 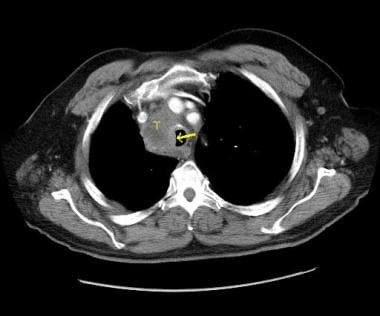 CT scan of chest in the same patient as preceding image with metastatic melanoma of lungs. Carden KA, Ernst A. Management of Tracheobronchomalacia. MJ Simoff, DH Sterman, A Ernst. Thoracic Endoscopy: Advances in Interventional Pulmonology. Malden, MA: Blackwell Futura; 2006. Vol 1: 344-51/Chap 24. Dozaki T, Imai K, Mizukami S. [Biphasic (ulcer-forming and ulcer-preventing) effect of adrenaline in rats]. Nippon Yakurigaku Zasshi. 1975 Jul. 71(5):405-14. [Medline]. Meenakshi S, Manjunath KY, Balasubramanyam V. Morphological variations of the lung fissures and lobes. Indian J Chest Dis Allied Sci. 2004 Jul-Sep. 46(3):179-82. [Medline]. Gonlugur U, Efeoglu T, Kaptanoglu M, Akkurt I. 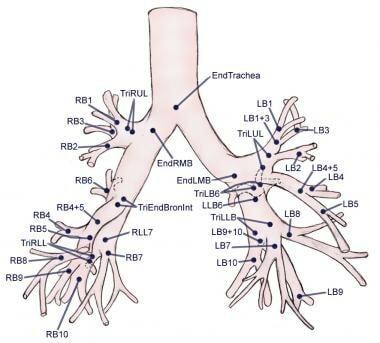 Major anatomical variations of the tracheobronchial tree: bronchoscopic observation. Anat Sci Int. 2005 Jun. 80(2):111-5. [Medline]. Hearts and lungs, anterior view.